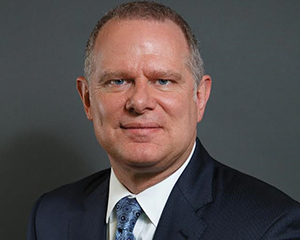 Elaine Maslin caught up with new Oceaneering CEO Rod Larson, at this year’s Underwater Technology Conference, and discovered his commitment to keep pushing the boundaries of what is currently possible. Rod Larson. Photos courtesy of Oceaneering. Rod Larson has only been on the job for a few months, but he is already tackling some of the industry’s biggest questions, from making deepwater operations competitive to getting ready for the next big technology innovation. Despite taking on the role of president and CEO at Oceaneering during oil and gas’ toughest downturn yet, he’s undaunted. The industry has always been able to push the boundary, he says. This year, Oceaneering, for example, started operating one of its offshore-based electric remotely operated vehicles (ROVs) from onshore, in Norway. And, while the oil industry may take a back seat and be a little slow when it comes to some technology adoption, “the things we do are unbelievable,” he says. Larson, who is married with two sons, took Oceaneering’s top job in May, having served as the firm’s president and COO before that. He started his career in wireline operations at Western Atlas, later acquired by Baker Hughes (now a GE company). He earned a Bachelor of Science in electrical and electronic engineering from North Dakota State University in 1990. Larson spent 22 years at Baker Hughes working his way through the ranks. In 2007, he earned a MBA from Rice University. At Baker Hughes, he became involved in deepwater development, working in operations in the Gulf of Mexico, before rising to president for Latin America. In 2012, he joined Oceaneering, serving as COO. Today, the challenge is the economic environment. With surplus oil in the short- to medium-term, the challenge is to reduce costs, to compete with the likes of shale. The contractors have a key role to play, Larson says. “The challenge we have is being competitive with other sources of oil and gas. It’s not as fun as making it bigger, it’s just a different problem to solve. “The question is, can we go back to US$20-30/bbl oil for decades and make a living? That’s where we started. The deepwater industry was largely born in a sub-$40/bbl world. I have no doubt the industry can and will thrive once again,” Larson says. Reducing time to deliver solutions is also important, he says. “It gives the operator a greater ability to understand what the demand curves will be in the determined time frame.” He cites standardization and reducing the amount of non-recurrent engineering as ways to help reduce costs. Standardization in umbilicals could improve manufacturing throughput in what has traditionally been stop-start, and therefore inefficient, operation. The Millennium Plus ROV at Oceaneering’s manufacturing center in Morgan City. 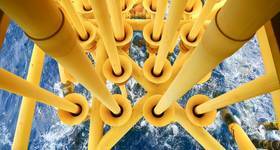 Technology is also high on the agenda at Oceaneering, a business which also works in the aerospace and theme park industries. 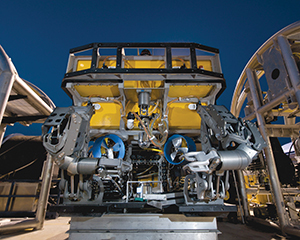 One of the firm’s recent flagship projects is its remotely piloted E-ROV, or all-electric ROV. Last year, a work class ROV deployed from the Songa Endurance semisubmersible drilling rig was remotely piloted from an operations center in Stavanger. This year, an eNovus work class ROV, this time supported by a 4G LTE data buoy and its own battery power, is being piloted from shore, also offshore Norway. It is stationed in a cage, with a tether management system, and is also fitted with automated control technology. Meanwhile, Oceaneering is doing work around automation for the theme park industry—such as trackless amusement park rides—and autonomous vehicles to work side by side with humans in factories. Some of that technology, including machine vision and machine learning, as well as artificial intelligence and virtual reality, is being applied to hybrid ROVs and autonomous underwater vehicles, to improve efficiency and vehicle intelligence. Oceaneering is also working on vessel tracking, understanding where all the vessels are in a given location and predicting future movements. For Larson, it’s also about “stretching the company’s wings,” in a way that can affect some change. This includes employing technology from Microsoft for big data, working with customers to interface with technologies from outside the oil field, and helping customers integrate with the likes of GE Predix. “It’s a new mindset that this next generation live in, where these services are not tools, they’re an extension of how they live and work,” Larson says.